I love middle eastern food so much that I would love to live there! They have such a wonderful culture, especially the Indians. What I love most about Indian food is all the spices they add because its helps digestion and boosts up the flavor. 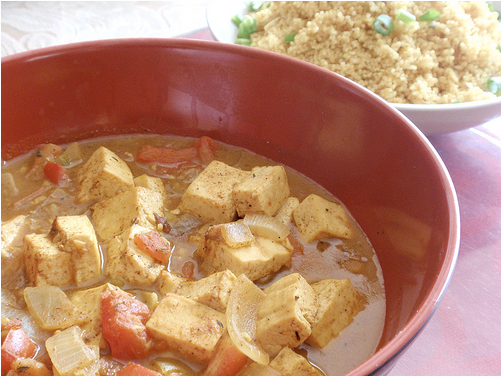 This Indian soup goes great with whole wheat couscous, which I'm sure is sold at your local grocery store. Step 1: Put all the spices in a little bowl and mix.Lightly grease a medium sauce pan (about 1 tsp olive oil) over medium heat. Sautee onions for a minute or two and put in minced garlic. Cook until the garlic is fragrant. Put in seeded tomatoes, let it do its thing for about a minute and half and take it off the flame. Put it in a bowl for the time being. Step 2: Lightly grease the same pot again. Put in cubed tofu. Let it cook for a minute and dump half of the spice mixture in with the tofu. Sautee for about 2 minutes. Step 3: Put in the onion/tomato mix with the tofu. Mix and place the rest of the spices in the pot. Stir it around for 30 seconds and pour in the water. Bring to a boil and pour in coconut milk. Cook under medium heat for about 4 more minutes and it's done!